The ongoing saga of out of control student loan debt took a detour through Washington for some partisan infighting last week, as House Republicans and Senate Democrats engaged in some busy finger pointing about who’s responsible for delaying a bill that would keep interest rates low on loans backed by the government. While the spectacle was entirely predictable, it pointed up yet again the impact student loan debt has on many areas of the economy – and why it isn’t gong away any time soon. 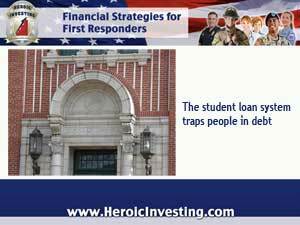 We’ve reported in this space before about the spiraling student loan crisis and its resemblance in some ways to the irresponsible lending that led to he housing collapse of a few years ago. And we’ve continued to talk about it from time to time because the debt problem isn’t just a problem for college students and new grads. The debt load carried by most students after a standard four year college education affects their credit, their earning power and their ability to participate in this consumer economy –which includes making major purchases such as houses. Now, some analyses say, the bickering in the House over the failure to pass a bill that would continue to hold interest rates on student loans at low levels reflects a continuing failure to recognize the real source of the problems. It’s not, they say, that students need more help to manage student loans – it’s that the student loan system itself is the problem, along with the rise in for-profit colleges that set students up for failure. Student loans have traditionally been subsidized by the government to keep them accessible to applicants at various income levels. But in the last few years, private lenders have gotten into the act, promising more money for things federal loans don’t cover – but at higher interest rates. And institutions of all kinds, from two-year community colleges to four-year universities are raising fees so that it’s all but impossible to get an education without a loan. Along with that, student loan debt has none of the safety nets other kinds of loans might have, such as mortgages. Students don’t have the option to refinance their loans. They’re nearly impossible to discharge, and are exempt from bankruptcy protections –main realigns why the default rate is so high. Why should income property investors following Jason Hartman’s wealth building principles care about student loan debt? In this credit-based society, a financially strapped individual won’t put much back into the economy. For many new graduates, buying a home – or other big-ticket item – is impossible. Either they’re skittish about taking on a mortgage debt or their credit is too risky for a mortgage. Those factors eliminate large numbers of younger buyers from the housing market and boost the demand for rental housing. How Does Student Loan Debt Hurt the Housing Market? Sallie Mae Enters Private Lending: More Debt to Come? Will Colleges Cause a Collapse?